Barlow’s Earthmoving is the sole manufacturer and supplier of Keppel and Kinka Large Mass Retaining Wall Blocks, supplying the Central Queensland region, including Rockhampton and surrounds, and as far south as Gladstone. These unique and innovative products are locally manufactured at our quarry, at 229 Kinka Beach Road, Tanby, 4703. Please contact Barlow’s Earthmoving for a quote. A range of custom colours and finishes are available. For full specifications and information, please view our online brochure or download our printable brochure below. (Please Note: Site specific parameters are required to be defined for individual retaining wall designs. 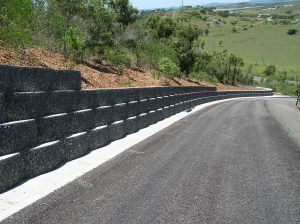 Keppel and Kinka Block retaining walls must be built to individual specifications as prepared by a registered engineer).